OKAY so I think everyone remembers my fantastic just married friend Tracy! 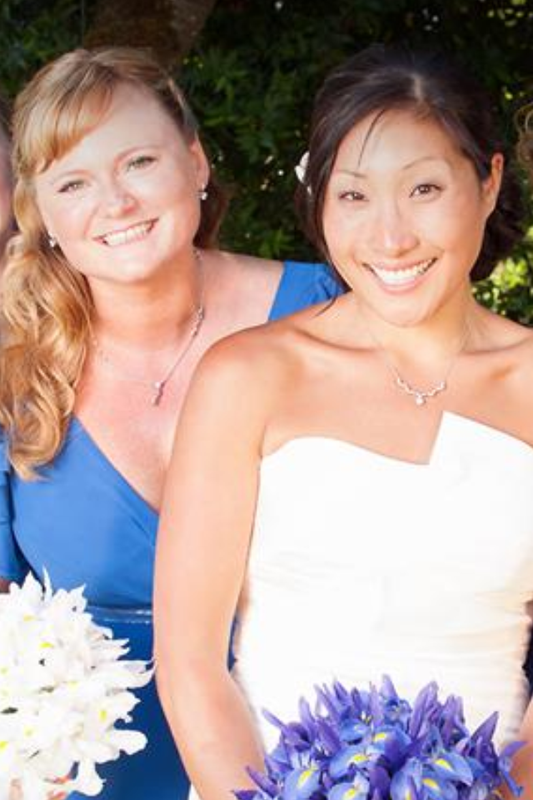 Remember, her wedding was the one that I ordered a bridesmaid dress 3 sizes too small because I was “so certain” I was gonna lose the weight by the wedding… and then gained 10 pounds. God Bless Spanks and a strategically placed bouquet. See! Just stand behind the bride and no one can see your bussom bursting forth! Well the now happily married Tracy has started a blog describing her one year adventure of cooking everything from scratch… I didn’t even know you could do that! I mean the most “scratch” cooking I ever did was make… okay I’ve never made something from scratch, unless you count scrambled eggs… is that scratch?? Anywho, I quickly offered to give her any blogging advice she needed, me being a seasoned blogger of almost 3 year. True, I sporadically forget I have a blog and when I do remember to blog something I usually end up sharing WAY too much… I think we all remember the great Brazilian wax of 2012. But seriously people, she’s had this blog going for about a month and. it’s. freaking. AMAZING!! She has fantastic writing skills, I LITERALLY feel like I’m in the room with her listening to her tell this great story. AND her new hubby is a photographer, so her pics in each blog are AMAZING, they’re like little pieces of art on your screen. Then there’s her recipes, SUPER easy to follow, with fool proof descriptions, that even I could complete… though I’ll probably never get to since the last kitchen fire has caused Hubby to permanently ban me from the kitchen and/or cooking. Just a Korean born, Polish raised, east coaster who’s fallen in love with the west coast, newlywed, who loves to cook and who is also slightly delusional that my four legged son will live forever. With the help of my studly husband our goal is to cook entirely from scratch; here’s our journey to that lifestyle. This entry was posted in Humor and tagged brazilian, cooking, fire, Friends, funny, hubby, laugh, life, marriage, photography, pictures, scratch, wow, wrong. Bookmark the permalink. Nothing’s better than a well told story…and pictures. Sounds delightful. You’re quite the marketing person, too. I LOVE this..I love it when bloggers support each other..and thank you so much for introducing me to your friend’s blog!